By the time time Kung Fu Panda 3 comes out it will have been nearly five years since we last saw Po and the Furious Five on the big screen. It's hard to believe there is even enough excitement to garner another installment in this Jack Black-fronted series as the sequel seemed to come and go with little buzz despite being rather solid in my opinion, but certainly a lesser version of the original. 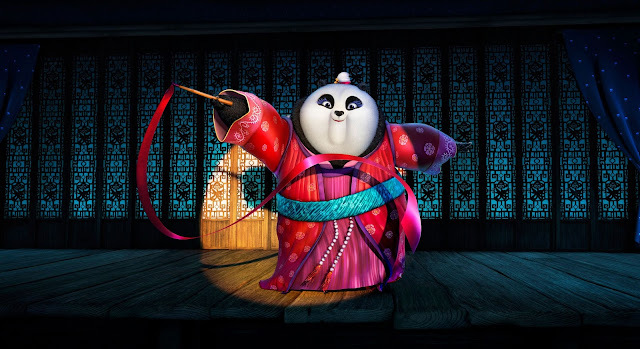 While I have enjoyed both installments in the adventures of Po Ping so far, I can't help but be somewhat weary of this third chapter that will complete what is at least the first trilogy in the Kung Fu Panda saga. If not for the several delays that the project has been subject to, but now for the decided upon release date of January 29, 2016. Typically, January is a wasteland that isn't exactly reputable for producing quality movies, but I understand Dreamworks motivation in that it cleared out of its December release date (just as everything else has) for Star Wars and has chosen its current date as it will open in both America and China the weekend before the beginning of the Chinese New Year celebration that will only boost the sequel's profile. As for the teaser itself, it's a nice bit of an exchange between Black's Po and new character Li (Bryan Cranston) that sets up the basic premise. Kung Fu Panda 3 also features the voices of Rebel Wilson, Angelina Jolie, Jackie Chan, Seth Rogen, David Cross, Lucy Liu, Dustin Hoffman, James Hong, Randall Duk Kim and will play in 3D.